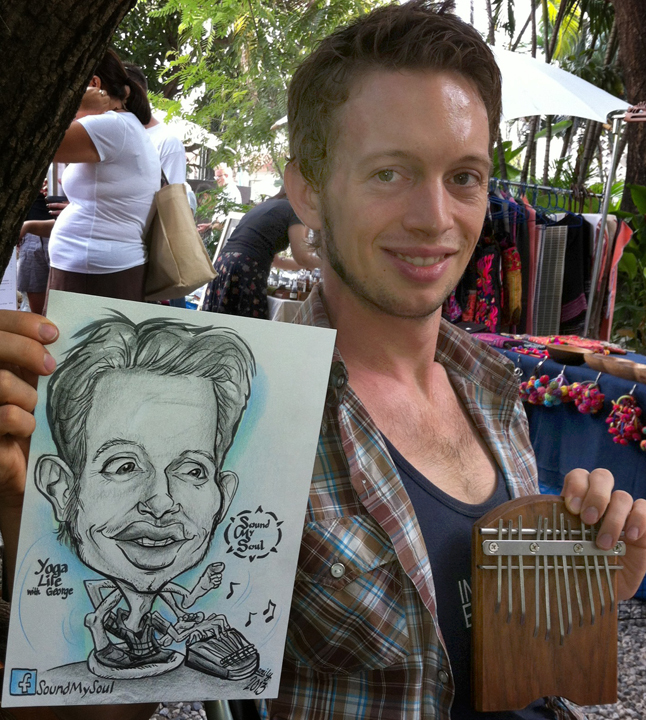 How many caricatures can you do in an hour? This depends on the type of caricatures I am doing. If I am drawing Black-and-White Shaded Faces ( which is what I do 95% of the time) the speed is 12-14 faces per hour. If I am doing line drawings only ( no shading or background color) I can 20 faces per hour. I usually include the event title, date, and use a one-or-two-color background which fits your theme, school, wedding or corporate color. For Color Faces, I can generally do 8-10 per hour. If bodies are desired, they perhaps add another minute or two to each drawing. These are approximate speeds, I have been known to draw even more faces per hour than I quote! It also depends on how quickly people get in and out of my chair, their age, if they are chatty, etc. How many people can you fit on one paper? Do they all have to sit there at once? Do they have to sit absolutely still? No, I generally can draw even squirmy babies if they can look in my direction for just a minute or two. That first impression is when I get the general likeness down, the rest of the time is for details and shading. What kind of space do you need to set up? I use a small drawing table, which is pretty compact. I ask the host to provide me with two or three chairs--one for me, and one for my subject--two if there will be many couples drawn. A small table is appreciated if possible--I can do without if necessary, but it's nice to have a place for folks to put theor drinks, etc. I also need access to an electrical outlet, for my easel lamp. If the event is outdoors, I need shade so that my subjects don't squint. And please don't seat me next to speakers or generators, so I can converse with your guests! What size paper do you use? I use 11" x 14" sturdy cover stock. A clear plastic bag is always provided with each caricature. Do you offer frames or mats? I can provide 12 x 16 personalized black mats (for a small fee per mat) if asked beforehand. I don't carry frames since they are easily available and such a personal choice. How many hours can you draw? Do you take breaks? I do have a two hour minimum for all events. If an event is quite far from me, I may ask for a three-hour minimum. However, I can draw almost any amount of time. I've drawn practically non-stop for twelve hours at some festivals I've done! Most gigs are between the two-hour to five-hour range. As for breaks, I take brief ones only if necessary, as I want to draw as many of your guests as I can! How do you deal with lines? Generally, the best way is first-come, first-serve. Sign-in sheets generally don't work as time is wasted looking for the next person if they wander off. The beauty of live caricature is that it entertains many while they are waiting to be drawn themselves! My scheduled drawing time is posted on a sign next to me so people will know when I am finished. If I am asked to stay longer, I note that on my sign, too. I'd like to book you for my event. What do I do now? Once you've emailed me for availability, I send a simple contract that lists the particulars of your party--client name, contact info, date, time, event location, and anything you'd like me to keep in mind (such as whether the event is a surprise, if there is a theme, what you'd like written on each paper, any special directions, etc.). I require a nonrefundable 1/3 deposit to hold your date for you (once I receive it, I turn down all other requests for my services for your time slot. If by some circumstance, I cannot do your event, I either refund your money or send a suitable replacement-- but so far in twenty years of doing this, that's never happened :-) Then I join you on your day and start drawing! -click the text box and begin editing. Use the text editor to customize your text. It's that easy!